The Ararat Rural City is set for a rail boost, with Victorian Premier Daniel Andrews this morning announcing 10 extra weekday passenger services for Ararat. 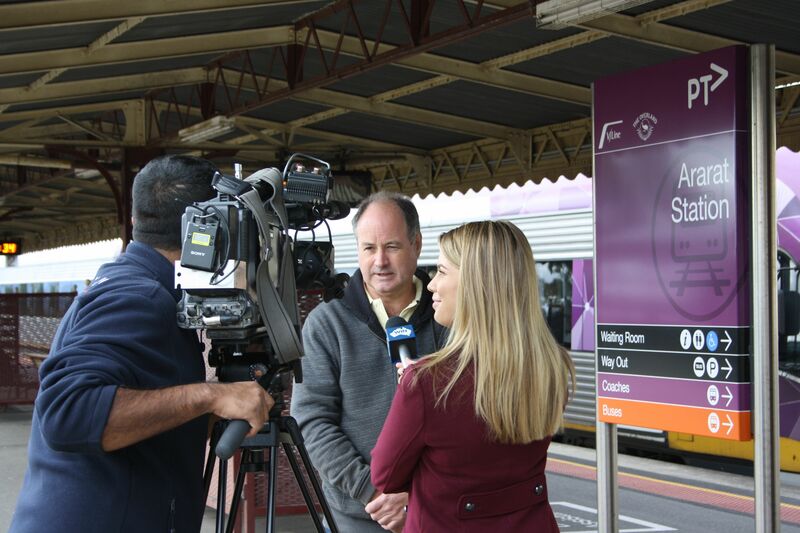 Ararat Rural City Council Mayor, Cr Paul Hooper discusses the rail announcement with the media. The announcement was part of the Andrews Labor Government's commitment to deliver more than 140 new regional train services across Victoria in August. This included 18 extra weekly services in Ballarat. Ararat Rural City Council Mayor, Cr Paul Hooper said the Premier's announcement was a win for the region. "This is fantastic news and comes after years of lobbying by the Ararat Rural City Council," he said. "An additional 10 weekday services is of benefit further than just Ararat, there are positives for our neighbours too and it strengthens our work of becoming a major rail hub." Cr Hooper said the details of what times the new services would run are being finalised between State Government, Ararat Rural City Council and V/Line. It is likely to see a train leave Ararat Station and arrive at Southern Cross Station before 9am and a return service from Melbourne departing between 5:15-5:30pm. "As a Council we identified the need to have a service that allowed Ararat passenger to get into Melbourne by 8:30am-9am and still return home at a reasonable hour. At the moment we haven't got that capacity," he said. "This announcement is going to help more people safely get to Melbourne for whatever activity they need to undertake, whether it is business, health, education or recreation purposes and that's great news."